This simulation demonstrates some common symptoms of dyslexia. You are given 60 seconds to read a paragraph aloud. The letters in this paragraph are reversed, inverted, transposed, and spelling is inconsistent. There will be two questions to answer at the end of the 60 seconds, so you must decipher the words as best as you can. This is a sample view of the timed reading exercise. 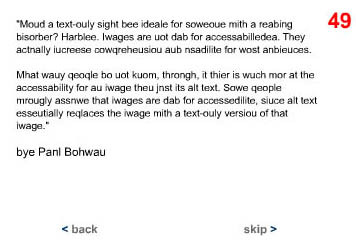 This was designed to give users an idea of the frustrations a person with dyslexia could experience while using the web. This simulation requires Adobe Flash and may not be fully accessible to individuals using screen readers and will not function on many mobile devices or other technologies that do not support Flash. Spanish by Language Marketplace Inc.
French by Language Marketplace Inc.